This is a technique that’s been on my mind for a while – a Long While! I rarely see it on goldwork pieces being designed and embroidered today, but it shows up often on ecclesiastical embroidery pieces from the past. It’s a type of raised goldwork. It looks like satin stitch (it’s actually surface satin stitch, or laid work, couched at the sides) worked over card or board or other foundations. We talked about this technique a little bit last year, when exploring this piece of old goldwork. This is my favorite example of raised goldwork. You can click on that photo above for a slightly larger image, if you wish. 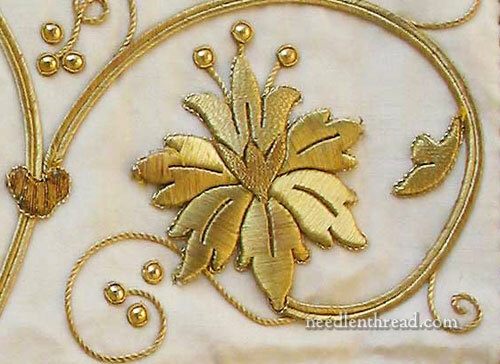 Roses, lilies, passion flowers, pomegranates, acanthus leaves – these are often the subject of this type of raised goldwork. But the lily above is especially exquisite, I think, and the technique is really shown off against the white silk background. Thankfully the photo came out ok – you can really get the sense of how the light plays off the direction of the gold threads, so that each petal reflects the light differently. It’s a lovely piece of work! Here’s another favorite example of the same technique. This comes from this goldwork chasuble that I wrote about ages ago. You can see the rose, the surrounding leaves, the acanthus swirl, and the bud towards the upper right of the photo all worked in this technique. 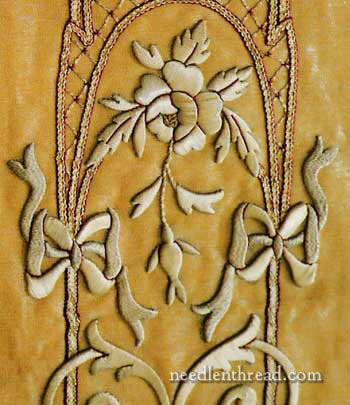 This is another example of raised goldwork over a foundation, also on an old vestment. This example doesn’t fall into my “favorites” category – I like it, but it lacks the delicacy of the examples in the photos above. There’s such a harsh contrast between the embroidery and the fabric. It looks very angular and hard. But the relief and dimension in this type of embroidery is fantastic, isn’t it? This technique is on my list for this year. I have the design lined up, but I’m on the hunt for just the right goldwork thread. I’ll keep you posted on what develops! You are a women after my own heart I was in Church the other day and I was looking at some embroidery of raised goldwork and I was wondering to my self as you do! how did they do that and voila you come up with the very article. I can’t wait to see your project of raised goldwork and how it’s done because I was thinking of doing the same thing so please show us the technique. I did a little bit of this technique on my advanced goldwork piece for the RSN (http://www.jessicagrimm.nl/fotogalerij.php?view=preview&category=1&q=&ImageGalleryPage=2&image=15). I was told by my tutors that the exact thread used back then, no longer exists. Apparently, it was a very thin, but flat thread. I used tambour thread #7. As that is round, it did slip off the edges easily and was a pain to work. I used it over thin card covered with felt to prevent much of the slipping. Please do keep us all posted on your hunt for the perfect thread! Thanks for the link to your work! 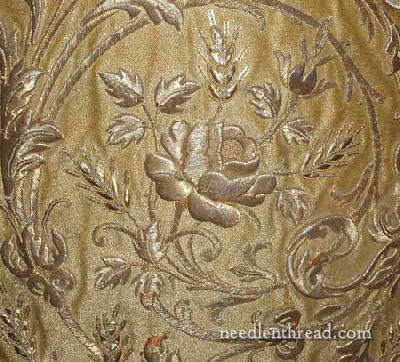 I like your “banner” for your goldwork piece – the cross in the middle is exquisite! What I’ve noticed with a lot of the older pieces (besides the fact that that tiny gold wire thread just doesn’t exist anymore) is that many employ different types of threads, not just single-gold-strand type of wire. I’ve found examples with 2-ply twisted threads, with flatworm that’s been twisted, obviously with rococo, and so forth. So I think there’s some scope for the type of thread to use, even if I can’t find a perfect substitute for the fine single gold wire. I’ve experimented with the tambour #7 as well, and I know exactly what you mean about slipping! On some old examples that I’ve taken apart, I’ve noticed felt over card. I’ve also noticed a hard, heavy felt, like carpet felt almost, as the foundation. So I think felt is a good idea, though I’m going to try several different foundations. With the felt, I’ve found it’s hard to get a really crisp relief edge. On most of the samples I’ve seen that are like the ones in this post, it’s actually a very fine gold wire (round) that has some stiffness to it, so it pinches well at the edges and the stiffness holds it in place. It’s not as thick as the tambour thread, even. It reminds me of one ply of Elizabethan twist, almost, though perhaps more wire-like. I haven’t noticed a particular flatness to it, except in cases where obvious flatworm is used. I’ll keep you posted. It’ll be a little while before I have it together enough to start running it on the blog, but it’s definitely coming! Thank you very much for your lengthy reply! My husband designed the St Alanus piece. Years ago, we aqcuired some human bone from fellow archaeologists when we were visiting Rostock in Germany. I’ve always wanted to construct my own relic and with my husband being Catholic, we came up with St Alanus of Rostock. So, some of the bone you see in there is actually human! I’ve also noted different types of padding. Some is just old newspaper with a lot of glue :). Or some calico with the glue. And sometimes they added a little snippet of a bible text. I think that is particularly sweet! Good luck with your project and I might join you! Beautiful! A technique I too have been researching for a year or more, just not sure what I want to do with the information yet…Can’t wait to see what you do. I can’t wait to see what you might have in store for us on the subject of raised god work. The examples are lovely to look at. Have you ever actually tried stitching the technique? I’ve been wanting to give it a try as well, but my hold up is the same – what thread to use. Tanja Berlin has such a lovely 371 wire that I’ve been thinking about trying. It’s so very fine and delicate, but also has a little stiffness to it. It seems different from the 371 wires that come from Access Commodities which seem to have some sort of core under the gold covering. Best of luck with the new project and thread selection! Oooooh! Another adventure to follow! Can’t wait! How beautiful! The smooth gold thread almost reminds me of a Japanese flat silk. I guess you would need to choose the paper or card you used carefullly and make sure it is acid free. Maybe some archival board that is used for matting artwork? Very interesting! Did you know there is almost no tradition of Australian ecclesiastical work? Only in modern times, with large applique and kid work. Before that, we imported from England. I’m reading “Needlework in Australia” atm. As usual your example pieces are gorgeous. I haven’t seen anyone raise this question so I thought I’d ask – – when one uses ‘card’ for gold-work is it presumed that the substance is archivable? Some card is made from wood-chip and glue and deteriorates or can create damage to the textile as the glue in it breaks down. (I’ve spoken with a few museum curators). I haven’t tried it, but perhaps heavy (300 lb) watercolor paper (a recognized brand like Arches or Lanaquarelle) would work when the sharp edges are desired? It’s just a thought and I hope it might be useful to the comments on this post. Yes, the first 2 are certainly the pick of the ‘bunch’ but I do like the bows on the last one. I wonder if it’d be easier on the eye if on a similar off white fabric like the first one. I think the rich gold fabric takes away from the embroidery. All the same, they’re precious and look forward to your project with great interest. Mary, I do hope YOU find the right thread so that WE can bask in some reflected gold shine. 😉 The first photograph truly took my breath away. I don’t think I’ve ever seen such a beautiful piece of gold work like the lily above. I understand why you would like to replicate it, and as truly as possible. It looks like Brazilian stumpwork using rayon floss. It may have been threads laid over adhesive and wrapped, each piece being pre-made before assembled into a design pattern. Of course, it could be machine embroidered motifs, too, but its hard to tell. I think the only foundation I haven’t seen mentioned here is leather. IIRC, it was often used in the kroje (sp?) – the traditional costumes from the Czech and Slovak regions. I’m thinking the foundation was probably whatever was at hand and gave the desired result, since it wasn’t intended to be seen? And it would free up more funds for the fabric and threads. I wonder if that last example would look better under candlelight and from a bit of distance? Even just by taking off my glasses and sitting back from the monitor (I’m nearsighted) I can see it much better than the 2nd example, which sort of blends into a muddle. This type of gold work ( gold threads over cardboard )is still being done today in Kyrgyzstan and Uzbekistan. The cardboard used is, are you ready, anything they have laying around, usually recycled cereal boxes. (I know, that just freaked out a lot of you.) I have several pieces done in this technique. The gold thread is very fine. The background is velvet. It is not wrapped around the cardboard, it is stitched over the cardboard. I could send pictures if you like. I too am anxious to see how this is done, so I may try it. Gorgeous. It’s not on my list to try, just yet, but someday . . .
Actually, I really like the extremely sculptural look of the third example, too – not on a vestment, which has to move with the minister/priest, but as a wall or altar hanging, it would be stupendous. Hi I am wanting to make stockings for my family. I want to use this technique. I have a piece off an old vestment that I am trying to match. Do you know of someone in Dallas Texas that teaches this technique.